Bead Caps are great for adding extra style and a special finishing touch to your next piece of beaded jewelry. Bead Caps are designed to go on one side or both sides of a bead. You can stack different bead caps together to create an even more unique piece of jewelry. 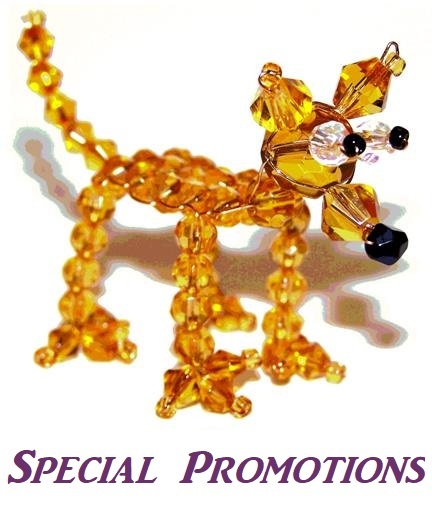 Here is some information on Bead Cap Sizing Information and jewelry design help. The first number on the bead cap will be how deep or tall a bead cap is. The second number on the bead cap will be the diameter or how wide the bead cap is. When we refer to diameter of bead caps we refer to the outside diameter. We are often asked what size bead cap to use for a certain size bead. The answer depends on the look you want the bead cap to create. If you have a 12mm bead and you put a bead cap on each end that is 12mm in diameter, those bead caps will stick out as far as the bead does. The bead caps will end up covering much of the bead and the bead caps will be the focus instead of the bead. Sometimes this is the desirable way to present certain bead caps but sometimes it is not. If you want this bead to be the focus you would use a bead cap with a smaller diameter. You could use a 10mm, 8mm, or even a 6mm bead cap in this case. Now on the other hand if you are just using one bead cap and you want to create a wrap around type of effect, you would use a larger bead cap. A 14mm or 16mm bead cap would be a great bead cap to use for this purpose. 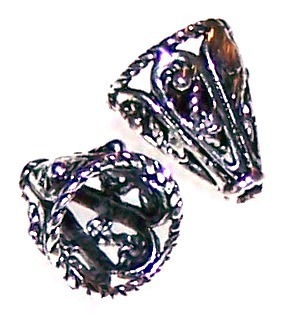 This package contains 5 Antique Silver-Plated 9x8mm Ornate Cone Bead Caps. 6mm Inside Diameter. 8mm Outside Diameter. 9mm long.